Bukit Lawang is part of the UNESCO World Heritage Site in Indonesia, on the eastern side of Gunung Leuser National Park which is one of the three National Parks in the UNESCO listing for Tropical Rainforest Heritage of Sumatra. 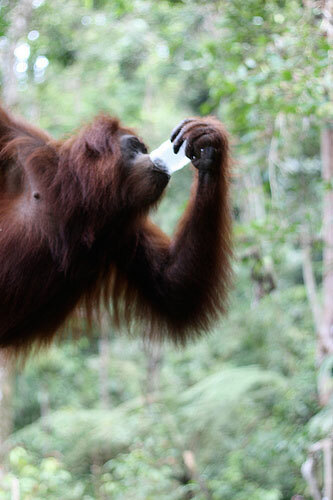 With its name literally means “door to the hills”, Bukit Lawang is an Orangutan sanctuary, therefore, many people come for trekking in hope to have sightings of the rare Sumatran Orangutans. Bukit Lawang is at 90km northwest from Medan, the capital city of North Sumatra and at the eastern side of Gunung Leuser National Park. 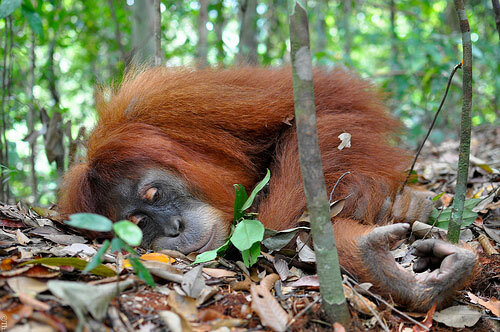 It is one of the last few places on Earth to see the Orangutans live in the wild. It is also famed as one of the top travel adventures to experience. 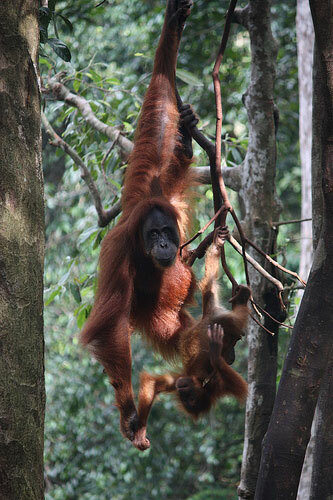 Most times in the year would be a decent for a visit to Bukit Lawang. You may want to take note of rainy seasons at the end of the year but the rain is mainly only in the evening or at night, so do not worry about it impeding your trip. You may want to check out local Indonesian public holidays, which means that many local tourists will crowd the village, especially on weekends. Orangutan Viewing Platform where there are twice a day feeding (8 am and 3pm), therefore you will be able to see the Orangutans for sure. Attending the feeding would cost 20,000 Rp though and there is a surcharge for camera at 50,000 Rp. This is usually a good opportunity to learn more about the Orangutans as the national park staff are well qualified and also to take great pictures as the Orangutans normally hang around while munching away the bananas. Bukit Lawang is one of the best place for jungle trekking as not only you get to bask in the natural jungle that is full of wild flora and fauna that will wow nature enthusiasts. You may have a chance to sight the Orangutans in their natural habitat, though not guaranteed, but possible if you follow your guides’ advises. There is also a nice waterfall on the way to relax and swim. During the trek your guides will also provide you with nice Indonesian food and fruits! It is not permitted to go into the jungle without a guide but don’t worry as there are many good reliable guides around. Just make sure to ask questions and choose properly to get a quality guide. It would be wise also to check with your guesthouse for recommendations. The price for a jungle trek is 32 USD per day; 80 USD for a 2 days trek with extra of rafting and 3 days trek with rafting can go up is 110 USD. If going for multi-day treks, please make sure you are in a fit condition. 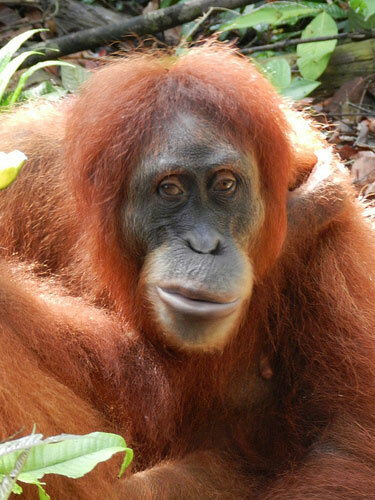 Community note: Please try to make sure your guides do not feed the Orangutans or other wildlife with common food as it may make them sick and in some cases die. Also please try not to get too close to the Orangutans as this would increase the risk of passing viral infections and diseases to them, which will endanger their chance of survival. 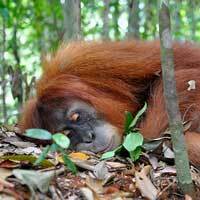 Do your bit to protect the Orangutans and other wildlife! If you have extra time to spend, one quite popular past time is tubing, where one uses an inner-tube to float down the river. Be careful as sometimes the water currents can be strong. You can also visit the bat cave for 5,000 Rp or kayak or just take a walk around the rice fields and rubber plantations, or visit some local projects or shop around the local market. There are guest houses dotted along the river in Bukit Lawang that are affordable and reasonably priced, therefore choices are aplenty. 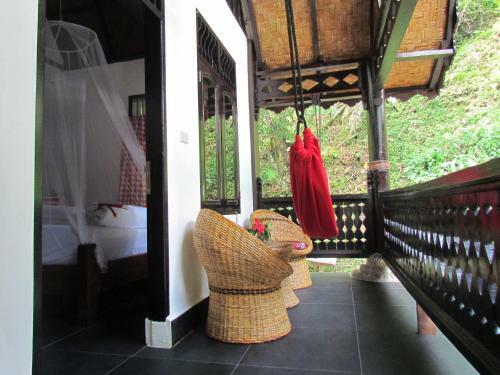 Availability of accommodations in Bukit Lawang * here is easy to arrange except during the busy tourist season which is June – August. This 3-star hotel is well loved by guests for its friendly service. The clean bright and spacious rooms come with mountain views and they also offer treks and tours. Definitely a gem in this jungle! New and well sought out by travelers, this cozy guesthouse has rooms with tall ceilings and sun terraces overlooking the jungle and mountains. It is located right next to the Bahorok River, lending to its serene atmosphere. Book early to not missed out! Try the local Indonesian food which normally would not disappoint. There are a few restaurants or cafes around that serve good home cook style of Indonesian food. If you want a variety from local food, there are choices of pizza or even vegetarians. Fly in to the nearest city Medan and then from there you can either take a taxi or rent a car/van to get to Bukit Lawang from the airport / hotel. Being a small village, you can cover all around on foot from one side to the other in just 25 minutes. There are three bridges across the river for easy access. On the way back to Medan, stop by the famous Lake Toba for a good chill and relax by the largest volcanic lake. 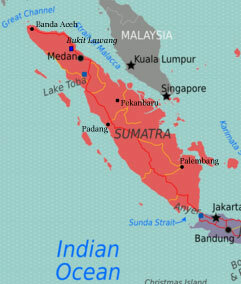 Also on the way, you can visit Berastagi which famous for locals for weekend getaways. You can hike out to the two nearby volcanoes, Sinabung and Sibayak. For these, you can check with your transports services back to Medan for a stopover or side trip. For solo female travelers, you may try to arrange with your guesthouse to join a group of other travelers for your safety. Bring mosquito repellants and general sanitary needs as although available for sale here, it lacks in choices.